Myza Mempesona: Ferrari Lost Again.....! Last night I watched the F1 Grand Prix , held in one of the newest circuit in Valencia, Spain. The circuit was the latest circuit that was built on ordinary road, after Albert Park in Australia and Monte Carlo. And of course, as a great fan of Ferrari team, I was expecting something good from the race. Nothing else, but for Ferrari to win the race . But, as usual in a race or competition, we could not expect everything to be good and nice all the time ! Anything can happen as it is beyond our own expectation or control. The same thing goes with the race. 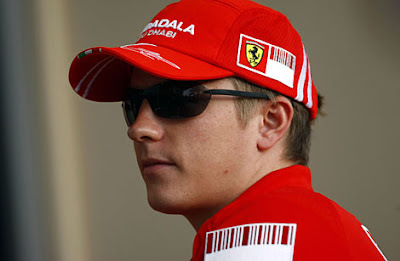 The Ferrari team driver, Kimi Raikonnen was out from the race as the car had engine failure! Oo why? Kimi why? I was hoping to see Kimi on the podium rather than Lewis Hamilton or other F1 drivers. To me, Kimi is a very good driver and he can go further in his career as an F1 driver. He started at a very young age and he is now among the favourite F1 drivers. I remember this saying when I was back in college used by a close friend of mine , 'Hope for the best, prepare for the worst'. I know that I must not put high hope for the Ferrari to win, but deep down inside, Go.... Ferrari Go....! Reach for the podium Kimi! I really want the Ferrari team to win! Too bad for the Ferrari team in Valencia. Eventhough, Felipe Massa from Ferrari team, was first on the podium, but he was said to be driving dangerously. Due to that, there's a possibility that he would be fined by the FIA. However , it's not finalised yet. Anyway, I am quite sad with the result of yesterday's race. Kimi was out of the race. I just hope that Mass would not be disqualified from the race due to his driving! If not, Lewis Hamilton will be the winner ! For Ferrari team, keep on racing! Dulu masa Mika Hakkinen dgn David Coultard dgn team McLaren Mercedes, mmg suka tengok! minat kat dua2 driver tu! Tak pe Kin,tak minat Ferrari.Myza satu family suka dgn F1 ni. GT japan pun suka!Merdeka Endurance race pun kdg2 pegi tgk jugak!